Biofilms can occur in a variety of places, from inside our bodies to industrial cooling towers. Biofilms are groups of microorganisms in which cells stick to each other, creating problems for the inside of pipe systems, causing corrosion and reducing heating efficiency. This article looks at the science behind biofilms and suggests an answer in liquid based treatment. Many different types of planktonic (free-floating) bacteria can be found dispersed throughout water in a water system. These come together to form a sessile aggregate, which adheres to the inside of the system's pipes. These attached bacteria then produce a matrix of extracellular polymeric substance (EPS), often referred to as slime, covering them completely. This matrix is a collection of DNA, proteins and polysaccharides that form a protective housing around bacteria, creating a safe space, and preventing biocide treatment from reaching the bacteria. In fact, bacteria in a biofilm are 10 to 1000 times more resistant to treatment than in their planktonic, free-floating form, as explained by Don Monroe in PLOS Biology. A biofilm starts when a few pioneer bacteria use specialised chemical hooks to adhere to a surface. This can occur in response to many factors, ranging from attachment sites present on the pipe surface, nutritional cues or sub-inhibitory concentrations of stress factors such as biocides. It is thought that the first colonists of a biofilm adhere to the surface initially through weak, Van der Waals forces and hydrophobic effects. Interestingly, the number of planktonic bacteria in the water does not correlate with either the formation or the presence of biofilm. Biofilms develop slowly at first, because only a few organisms can attach, survive, grow and multiply. However, after this initial colonisation, populations increase exponentially as bacteria continue to multiply, increasing the thickness of the biofilm rapidly. Furthermore, other bacteria and non-living debris in the water adheres to the sticky biofilm matrix to join the colony, and advance the biofilm. This means the biofilm often includes many different bacterial species which contribute to the complex slime matrix. Dispersal of bacteria from the biofilm colony is an essential stage of the biofilm life cycle, enabling spread to other parts of a water cooling system. This happens when bacteria within the biofilm spontaneously secrete enzymes, such as dispersin B and deoxyribonuclease to break out of the slime matrix, and back into the water. This reverts some of the bacteria back to their free-floating planktonic state, free to start a new colony of biofilm elsewhere in the system. Researchers have tried to harness the signalling and chemical power used at this stage, as this could be the key to breaking down the biofilm matrix. Once a biofilm has advanced, it forms a complex structure in which different bacteria occupy different environments. This sophisticated approach means bacteria towards the outside of the community have a very different structure to those deep within the matrix. It is this diversity that adds to the stubbornness, as treatment will need to target many different physiologies. A biocide may be effective against one bacterial strain, but the other strains may remain unaffected. Without breaking down this complete protective layer, the bacteria will remain protected and free to multiply. Furthermore, the bacteria contained within the matrix use quorum sensing, meaning they are constantly undergoing genetic divergence. This gives biofilms phenomenal recovery and re-growth abilities after a population hit, often caused by treatment attempts. The United States National Institute of Health says that 80% of chronic infections are biofilm related. This research looked specifically at biofilms inside the body, but biofilms can also occur in many other places, including industrial cooling towers. They are associated with the spread of Legionella bacteria, which can cause Pontiac disease, or worse; Legionnaire's disease, a potentially deadly form of pneumonia. The problems occur because of amoebae (single-celled organisms). Amoebae join the biofilm colony and feed on the bacteria within it, including Legionella bacteria. The ingested Legionella then proliferate within the amoeba as it provides suitable conditions for the Legionella to multiply. This makes them a huge health hazard in many industries and is why it is so important to manage and control the presence of biofilms. 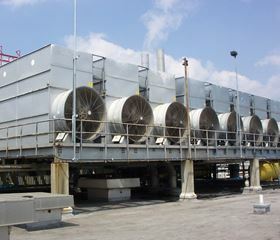 Many industries rely on water cooling systems, with processes that depend on heat being removed from a production area quickly. If the pipe of the water cooling system is coated in biofilm, then the heat exchange from the hot item to the cool water becomes much more difficult. It's could be compared to someone trying to cool down but refusing to remove their coat - it's inefficient. A biofilm layer of just 0.1mm can reduce efficiency so much that the associated electricity costs to power your plant can increase by four times more than if the system contained the same thickness of calcium carbonate scale. Biofilms are rarely detected, mainly because plant managers are not actively looking for them. They often aren't considered as the cause of increased electrical costs. It also doesn't help that biofilms are generally just a few microns thick, 100 times smaller than the cross section of a strand of hair. Using the latest techniques, a water treatment specialist, such as the technical team at NCH Europe, can inspect cooling systems and analyse samples to detect the presence of biofilms inside a water cooling system and advise on appropriate treatment. Biofilms are also a leading cause of microbiological corrosion. They can contain sulphite-reducing or iron-depositing bacteria that destroy steel, wreaking havoc on the pipes of water cooling systems. Microbiological corrosion accounts for up to 50% of the total costs of corrosion to economy. Compared with standard corrosion, it is 10 to 1000 times quicker to develop and is 10 to 100 times more aggressive. If left untreated, this can have costly consequences to ‘mission critical’ equipment in cooling systems leading to expensive repair works and down time. However, there's no medal available for a water system working extra hard to complete a task. By treating biofilms, you are removing an unnecessary and costly coat.